Do you love burgers but want something a little lighter? 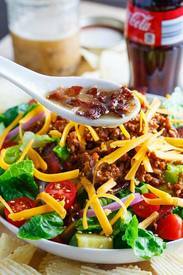 How about a Bacon cheeseburger salad with all of the flavors of a Bacon cheeseburger in salad form. This salad starts out with ground beef that is seasoned with common burger patty ingredients and condiments including worcestershire sauce, ketchup and mustard. The salad continues with other common burger topping including lettuce, tomato, onion and pickle and of course plenty of cheese and Bacon along with a warm Bacon vinaigrette! If these aren't your favorite burger toppings, you can easily change the salads ingredients to what you want! This meaty salad sure does eat like a meal and it's perfect for for salad for dinner especially if you are a fan of Bacon cheeseburgers!